The Dine-Around is always one of the highlights of the MenuDirections conference and this year in Charleston will be no different. The Dine-Around gives attendees a chance to sample dishes from three Charleston restaurants. We talked to the staff from each of the Dine-Around restaurants on this year’s agenda to get the inside scoop on what kind of culinary delights attendees can expect Feb. 26. What should a first timer to A.W. Shucks know? Just that we create a feeling of fun with fresh seafood and Lowcountry cuisine. History: This restaurant has been here since 1978. 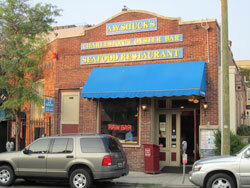 It was one of the first restaurants in Charleston on Market Street. We still serve some of the same recipes from when we first opened. Signature dishes: We’re known for our seafood jambalaya, which features pulled chicken, smoked sausage, french fries and creek shrimp simmered in a creole sauce served over red rice and finished up with a cracklin powder. People also come from all over the country for our crab dip, which is a delicious, chilled blend of choice crabmeat, cream cheese, cheddar cheese and special seasonings, served with crackers from the recipe that we’ve had since the restaurant opened. What should a first timer to Fleet Landing know? We have a fabulous view! We try not to be just any restaurant on the water. We try to match the caliber of our food and service with quality of our views. We specialize in seafood, but we really strive to elevate what we do here across the board as far as being involved with local and sustainable seafood and being involved in the community. History: The building where the restaurant is located used to be a naval building that sailors were processed through in the ‘30s and ‘40s to get into Charleston proper. The restaurant opened in the space in 2003. Atmosphere: There is again, an amazing view. The building itself is an industrial building and we’ve done minimal decoration. It definitely has a neat industrial feel to it with the concrete floors, which can definitely make guests feel the nautical theme permeating through the space. Signature dishes: Our Charleston shrimp and grits are famous. Everyone has their own version in the Lowcountry, but ours features jumbo shrimp and andouille sausage sautéed in a tasso ham gravy over creamy grits, which we buy from the oldest mill in the nation. We also definitely put a twist on our stuffed hush puppies. We take large hush puppies and fill them with a veloute of lobster, rock shrimp, leeks and corn and serve them over creole tomato sauce. What should a first timer to High Cotton know? We definitely specialize in Lowcountry cuisine. We try to use as much local product as possible, which includes produce, fish and meats. Lowcountry cuisine really goes back to the spices—like cayenne and cumin—you use. It tends to be a very flavorful type of cuisine. We make almost everything from scratch. We also cure our meats in house. History: The restaurant is part of the Maverick Southern Kitchens Restaurant Group, which manages four restaurants, including the Charleston location of High Cotton, and a kitchen store. Atmosphere: High Cotton features hardwood floors, celling fans with palms for blades, high ceilings and lots of exposed brick. The restaurant is located in a building that is nearly 200 years old. Signature dishes: Our crispy pork belly with beet reduction, frisée, caramelized apples and sauce gribiche is one of our most popular appetizers. The house specialties definitely include our pan-roasted flounder, which is served with a sweet potato puree, roasted cauliflower, shaved Brussels sprouts, saba and parsley oil; and our pumpkin seed crusted salmon, which features butternut squash, sautéed collard greens, shrimp and a black-eyed pea vinaigrette The menu changes seasonally and depending on what products are available. MenuDirections is FoodService Director's annual conference for non-commercial foodservice operators. It features presentations by experts from inside and outside the industry, as well as hands-on chef demos and an opportunity to taste the trends.